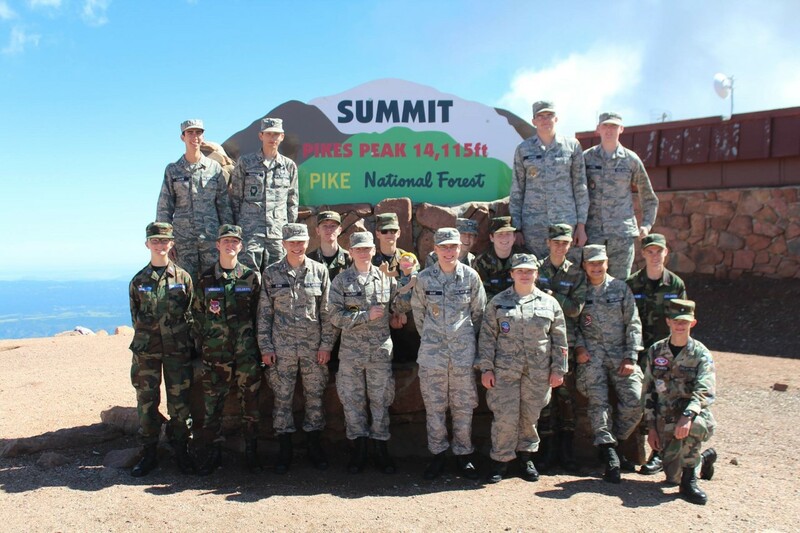 8/7/2017–ELM CITY, NC–The 2017 Air Force Space Command Familiarization Course, held in Colorado Springs, Colorado from July 15-22, was a great time for all 18 cadets and 7 senior members who came from all over the US, including California, Tennessee and North Carolina. On the first day, the event was kicked off with going bowling as a team-building activity at the Peterson Air Force Base bowling alley. The next day we hiked around the Garden of the Gods park, a section of rock formations, plants and animals with excellent views of the nearby Rocky Mountains, including Cheyenne Mountain. We then went to a penny arcade in Manitou Springs. In that area, there was also a water fountain the dispenses water from the springs and a few gift shops, one of which evidently sells puppets, as Bravo Flight member C/SSgt Malament bought one, who would become known as Nigel Cinnamon, school mascot. The third day was spent primarily in Peterson AFB, this time we began receiving our talks from the various squadrons. That day we learned about NORAD and NORCOM in one of the many interesting conference rooms we would see in air force bases that week, with the greatest one being in Buckley. Throughout the week we visited Peterson, Buckley, and Schriever Air Force Bases, along with the Lockheed Martin facility in Colorado. Some standout events were when we visited one of the radomes in Buckley AFB with the Second Space Warning Squadron, saw satellites under construction at Lockheed, and the GPS and satellite communication control centers at Schriever AFB compliments of the 2nd and 4th Space Operations Squadrons. We also visited the Air and Space Museum at Peterson AFB, where we were shown around by a particularly vocal tour guide named Joe. He used to work in intelligence for the Air Force and had all sorts of interesting stories to tell us about nuclear missile silos and Russians. The week was closed out with classroom instruction in the Moorman Space Education Center in Peterson AFB where we covered topics such as orbital dynamics, orbital rendezvous, and the electromagnetic spectrum. One of the instructors there was an ex-sonar operator and nuclear silo member, and was currently working in intelligence, magic, and Elvis impersonation. Finally, we had the graduation banquet, where everyone was awarded their certificate and challenge coins, and we also found out that Air Force Master Sergeant Gagnon had secured a signed astronaut picture for each of us. This activity was a great time for all and I would strongly recommend it to any cadets with an interest in space or in exploring careers in the U. S. Air Force.